Jaren Johnston, Kelby Ray and Neil Mason are a classic Southern rock trio with impeccable Nashville pedigree. Songwriter and guitarist Johnston writes most of the songs – he is also a Grammy-nominated writer for many other acts – and the group take it to the limit with blizzards of guitars, lap steel, Dobro and the like. They sound the part, they look the part – and, hell, they take audiences apart. Their self-titled debut album is causing a real buzz. No wonder. It’s hog heaven for lovers of bourbon-soaked rock’n’roll. Fun, energetic and packed to the brim with songs about their locale, The Cadillac Three’s approach is exemplified by the opening statement of intent ‘I’m Southern’ and rubber-stamped by the anthem ‘Whisky Soaked Redemption-. During UK shows in early 2016, TC3 slayed club crowds with a combination of high-energy electric and sweetly subtle acoustic performances, and lifted any wintry gloom with their positive observations. If you love The Black Crowes, Kings Of Leon, Blackberry Smoke, Whiskey Myers and good ole Lynyrd Skynyrd, you will adore these three fine gentlemen. Jaren Johnston is a native of Nashville, Tennessee, and comes from impeccable stock. His father, Jerry Ray, was in the hot country group Bandana, and Jaren’s first significant foray into the business was as part of American Bang (aka Bang Bang Bang). The group would go on to sign a record deal with Warner out of LA and make their self-titled debut album with legendary producer Bob Rock (Metallica, Bon Jovi, Aerosmith). American Bang toured extensively from 2006-2010, performing with acts such as ZZ Top, Pretenders, The Black Crowes and many others, as well as playing major festivals such as Bonnaroo, Coachella, Austin City Limits and Lollapalooza. Albums I Shot The King and American Bang drew favourable reviews and were noted for stylistic links to Deadstring Brothers. When that project ran its natural course, however, Johnston, Kelby Ray and Neil Mason bid farewell to lead guitarist Ben Brown and formed TC3. Mason and Brown had also appeared in the fine pop/rock band Llama, a showcase for their multi-instrumental talents. Mason is also a gifted songwriter with credits including Jake Owen (‘Days Of Gold’), Rascal Flatts (‘Payback’), Kelly Clarkson (‘Go On’), Tony Lucca (‘Reckless Love’), Macy Maloy (‘Give A Little Time’), Tyler Bryant & The Shakedown (‘Fools Gold’ and ‘Poor Boy’s Dream’), Emily West (‘Dangers Of Love’), and Kyle Andrews (‘If You Wanna Shine’, ‘Falling Into Flying’). The song is a perfect introduction and an obvious point of entry if you haven’t yet discovered TC3. Once they get you hooked it’s a case of jumping on ‘Party Like You’, falling under the spell of the Gothic ‘Tennessee Mojo’ and joining in with the crazily addictive ‘I’m Southern’, all of which have atmospheric and classy videos to flesh out Johnston’s narratives. 2015 also saw the hit single ‘White Lightning’ become a digital sensation, while TC3 received an Academy Of Country Music Awards nomination for Vocal Event Of The Year, as ‘The South’ continued to enjoy a remarkably long life. It’s just one those songs that you know is a destined to become a classic. Dedicated to the cause, the group thought nothing of playing a show in America in 2015 before immediately flying in to the UK to play the Download Festival, where they took no prisoners – even though they had to borrow Black Stone Cherry’s gear, since their own equipment hadn’t made it across the ocean in time. In many ways, TC3 are part of a new movement that includes Florida Georgia Line (Tyler Hubbard and Brian Kelley), Luke Bryan, Brantley Gilbert, Colt Ford and the phenomenally successful Dierks Bentley. But they also evoke links to an authentic past. You can hear echoes of the Allman Brothers in their debut, along with some clever nods and a tips o’ the hat to Bruce Springsteen, so they are well placed to be in it for the long haul. The hot-off-the-press track ‘Graffiti’ brings them bang up to date with a thrilling rock ballad that talks about small-town fame, an ambition that’s spread around by word of mouth from town to town with a cool subtext that champions the underdogs – the kings and queens of the city who are struggling to get noticed. 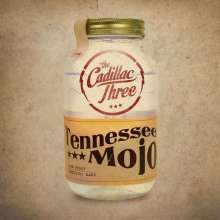 So, gravitate at once to their debut album – it’s called Tennessee Mojo in the UK – and immerse yourself in a world of fabulous Southern sounds. If you’re not instantly converted, check your pulse. The music press has, over the years, a habit of labelling bands with snappy names with Punk, Grunge and the not so catchy NWOBHM all entering the musical dictionary. Undoubtedly Nashville Rockers The Cadillac Three will have writers scrambling for a suitable moniker to tag them with. Maybe "Banjo Metal" is just a little too naff but is a pretty decent succinct description of where they are musically. With a nod towards the heavier side of Lynyrd Skynyrd, the punch of Blackfoot and the quirkiness of the much missed Raging Slab this is full on rabble rousing red neck Rock 'n' Roll. Album opener 'I'm Southern' raises the flag high and may well become the clarion call to Southern Rockers in the future. Jaren Johnston's whiskey soaked southern twang along with the undercurrent of banjo and ginormous slab of slide guitar sets the tone of what's to come.